This year, we have chosen The Forgiveness Project as our Charity of the Year. The Forgiveness Project is an award-winning, secular organisation that collects and shares real stories of forgiveness to build understanding, encourage reflection and enable people to reconcile with the pain and move forward from the trauma in their own lives. This year, to coincide with our 10th business birthday as The Alliance, we wanted to make our Charity of the Year one that we could help in a meaningful hands-on way. Barnardo’s proved to be an excellent choice. As an organization, Barnardo’s fights for the UK’s most vulnerable children, supporting those who need it most. And in our brief time with them, we found it to be staffed by truly inspirational people, to whom we can all be grateful for doing what they do, and for doing it so kindly, professionally and authentically. We spent a day with the team in Basingstoke and some of the young people they work with: you can read an account of our experience below. The most vivid memory I will carry with me from our Alliance day at Barnardo’s* is the look of mingled surprise and delight on one of the winners’ faces when first place in ‘The Apprentice’-style competition was announced. Ruth, Juan and I had spent the day with six young people and in our view, all of them were winners. The Barnardo’s staff quietly insisted that we had a distinct first, second and third place. At first we were surprised, and then impressed – they wanted to emphasise that in real life sometimes you have to deal with losing, even if you’ve done your best. And treating the young people as able and mature enough to accept this was indicative of the sensitivity, capability and commitment the Barnardo’s South East team very evidently bring to their roles. In fact the whole day had been full of surprises. We were volunteering our time as a small way of giving something back, part of a suite of activities to mark The Alliance’s tenth anniversary. Our key contact was Kay and from the start we had been struck by her passion and dedication. When we met her colleagues Mike, Nikki and Rachel in the Basingstoke office, we were extremely taken by the way the whole team was fully engaged with the young people enrolled in the programme and with the mission of making a difference. Their work must be difficult and emotionally challenging, yet they do it with a sense of lightness, ease and expertise. It takes a special kind of person to do this kind of role well. I don’t think I could do it, and I am so pleased they do – the value they add to the individuals they work with, and by extension to society as a whole, is immeasurable. The young people themselves were a revelation. The very fact that they had turned up to participate in the Summer Programme during their school holiday was testament both to their own engagement and to the quality of the outreach work done by Mike and the team. The group we worked with had mixed levels of confidence, ability and enthusiasm, yet they all took part willingly in the day’s task, creating a proposal for a new community centre in their local area. Each team had to prepare two posters, one of text, the other a visual representation of the project, and then pitch it to the panel (comprising the three of us, role playing representatives of a fictional millionaire businesswoman). The outputs of each team were creative and highly individual, reflecting their particular interests and concerns and again, surprisingly impressive. Even seasoned business people frequently express greater fear about public speaking than they do about death, but each of our teams got to their feet and made a credible presentation of their ideas. It was a moving experience to hear each group talk about what they’d done, to register their pride in their achievement at having done so and hear them field questions, sometimes knowledgeably, sometimes amusingly, always authentically. I felt tears nudging the back of my eyes as ‘my girls’ held up their posters. As we travelled home, one of our reflections was that small things can make a big difference. The feedback we received afterwards was that the young people were ‘made up’ (thrilled) that we’d volunteered our time to come over from London specifically to work with them. We gave our energy, our coaching skills and a day of our time: what we gained was so much more. We had the privilege of witnessing these young people’s strength of character, their ingenuity, their willingness to try, and their immense potential. Believing in their strengths and abilities can help them flourish: we were lucky to have a brief glimpse of this during the single day we spent with them. Thanks to the unflagging efforts of people like Kay, Mike and the team, Barnardo’s can do wonderful work in helping vulnerable young people develop, and to recognise and fulfil their potential on a long-term basis. We left the day stirred by the sense of possibility we’d experienced and delighted that Barnardo’s is there to believe in children and to help young people live up to their own possibilities. * As one of the UK's leading children's charities, Barnardo's works directly with over 200,000 children, young people and their families every year. They run over 900 vital services across the UK, including counselling for children who have been abused, fostering and adoption services, vocational training and disability inclusion groups. Every Barnardo's service is different but each believes in the potential in every child and young person, no matter who they are, what they have done or what they have been through. At the beginning of 2013, we set ourselves a challenging goal for the year – a big hairy audacious goal as Jim Collins memorably put it in Built to Last. 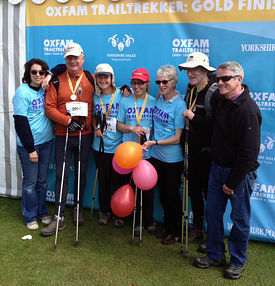 We decided to participate in the Oxfam Trailtrekker sponsored walk in June. And we are delighted to report that we were successful in walking 100km in under 30 hours and have exceeded our target of raising £10,000 for Oxfam – a big thank you to all those who supported us! If you’d like to read updates of our experience, or support us with a donation, please visit our fundraising page. Thank you! We have compiled a list of our Top Ten Tips to support and encourage anyone who is thinking of giving this kind of challenge a go. We have shared this with the team at Oxfam, and you can download a copy here. The last energy drink has been drunk, the last Snickers bar has been eaten – and in the event we didn’t need as many of either as we thought we might. We did it! The Alliance Yompers yomped home after a blistering 108km (the 100km turned out to be a neat marketing number) in 28 hours 32 minutes. What a team. The walkers were all in remarkably good shape at the end of the Trailtrekkers course and we were definitely all still smiling as we were buoyed across the finish line on a wave of euphoria and exhaustion. We put this down to the back-up provided by our remarkable support crew. They fed us energy-giving, appetite-tempting food, from soups and sandwiches to homemade cakes and bacon sandwiches. They stretched out our stiff, weary legs at every stop and tended our blisters. They sent motivational messages from South Africa. They dressed up in pink romper suits and rude aprons with sheep on. They drove down winding country roads in the dead of night without any sleep. They fetched and carried for us, they hugged and smiled. And most importantly, they were with us not just physically at checkpoints, but in our hearts and minds at every step of the way. Also very present in our thoughts were all our family, friends, colleagues, clients and well-wishers. We’ve been overcome by the support we’ve received, in donations but also in motivational messages. This meant a lot: we wanted to do our best not just for ourselves, and for Oxfam, but for everyone we knew was behind us as we walked. The course itself was gruelling but spectacular. It took us past mirror-flat canals and through rain-lush valleys; across boggy hillsides and up brutally steep gravel forest paths; up endless rocky steps onto bleakly beautiful limestone escarpments; through quintessentially English villages of warm stone cottages; through fields of dazzling yellow buttercups; and past furry Highland cattle weeing in streams. Walking through the night was cold and tiring, but also magnificent. The sky arched black and silent above us, speckled with stars and with a jagged half-moon hanging watchfully above us. Oxfam volunteers had hung glow sticks in trees to guide us, and as we groped our way along the uneven ground underfoot they were like little beacons beckoning us to success. Quite magical. As Sunday dawned, a sunny glow hung above the river we were tramping alongside and we knew we were going to make it. Eight weary hours later, we arrived back in Skipton and began what felt like a victory lap through the town to Aireville School, with locals of all ages congratulating us. Reaching the finish line, where we’d started out over 28 hours earlier, apprehensive and unknowing, was a proud and emotional moment. We hugged each other and our supporters and bowed our heads to receive our well-earned Trailtrekkers medals. We hadn’t known in advance if we could do it, but we did it, and the achievement feels like something worth savouring. We’d like to thank you all again for your support and your interest. You helped make it possible and we are well on our way towards our goal of becoming Platinum fundraisers by raising £10,000 to help Oxfam help people in need. And of course it’s not too late to donate! All you need to do is visit our Just Giving page. 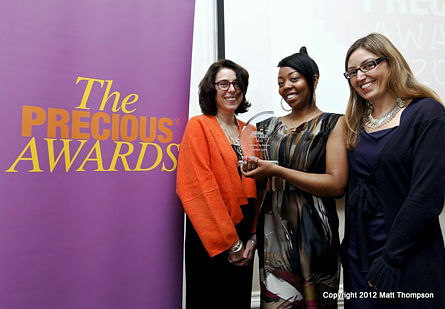 Our charity of the year for 2012 was the Precious Awards. As part of our goal of helping small businesses, we were delighted to be able to continue our work with the Precious team by delivering an Alliance coaching programme to the winner of the start-up business of the year award (you can read about the Awards ceremony here). Inspiring. Uplifting. Humbling. Just a few words that spring to mind as I think about the 2012 Precious Awards, held at London’s Waldorf Hotel on November 24. And as inspiring woman after woman (with one man sprinkled into the mix) took to the stage to claim their awards, most eyes in the room prickled with emotion more than once. From established senior women, such as Charlene White, presenter and journalist for ITV News and ITV London, who won the Woman in Public Life award and Nadia Jones, support manager for the London Youth Support Trust, who was crowned Mentor of the Year, to young women who have already achieved a phenomenal amount, such as Amie Samba, named Young Entrepreneur of the year for Fun Run Startz, the event was a veritable storybook of striving, success, and celebration. The Alliance sponsored the start-up business of the year award with the prize of a coaching programme to support the winner in developing their business and in achieving a success that’s meaningful to them. This is in close alignment with one of the principles behind the Awards: that it’s not just about one afternoon (wonderful though that may be! ), but about the continued support of the finalists. We wanted to help in this support and Ruth Sack and I were delighted to be at the event, in a room dancing with energy, enthusiasm and pride, to present the prize. After our very own Oscar moment, the worthy winner was revealed as Lenique Louis. Lenique is a jeweller who works from a studio in Holborn, handcrafting unique rings using the ancient, and now rarely-practiced, technique of hand carved wax. She perfected her craft with the oldest jewellers in the world, the Queen’s Jewellers Garrard and Stephen Webster and in The Alliance we are thrilled that we are going to be working with her. One of the things that characterises how we work in The Alliance is that we love to dream dreams – and then think creatively about the next steps to making them come true. One of our recent dreams has been to work with small businesses, to help them develop and grow and be at their side to help, challenge and encourage them as they achieve the fantastic things they’re aiming for. So being involved with the Precious Awards is a bit of a dream come true for us. We hope that in working with Lenique, we’ll be able to help her make some of her own dreams come true, being there for her as she takes her next steps to future business success. The Precious Awards themselves are the brainchild of Foluke Akinlose and 2012 is the sixth year they’ve been held. At the core of the Awards is a deep commitment to giving a platform to women of colour in business and leadership and to celebrating success in all areas of life. Foluke is a very modest and unassuming person, but she has achieved an immense amount herself. She has brought so much to the black female community, both with these prestigious business Awards and the work she does with her online magazine, Precious, which she founded in 1999 because there were no digital platforms for women of colour. The Precious Awards have garnered much support from the wider business and political community. Nick Clegg describes them as ‘a fantastic event that has recognised the achievements of some of the brightest and most inspirational Black and Asian women in society’ and Foluke was deservedly honoured with an MBE in the 2010 New Year’s Honours list for her devoted work. It was an honour to be involved in such an event: a very precious day indeed. One of our coaches, Ann Orton, has successfully completed a tandem skydive in aid of our Charity of the Year, Breakthrough Breast Cancer. Alliance members, clients and client organisations have contributed very generously towards this cause. Ann has raised in excess of £22,000 and altogether the jump raised £175,000 and counting. Thank you very much! With enormous efforts on the part of seven gutsy businesswomen and all those in support, the tandem skydive for Breakthrough Breast Cancer raised more than £160,000 and counting! Flight 002 of The Booby Birds eventually took to the air on Saturday 3 September – not without drama, as we waited for four hours for the cloud to clear. We were a breath away from a third postponement. And the flight itself – well, it’s almost impossible to describe the experience of free-fall for about a minute and five or six with the parachute! But here goes. First you dress up in a magenta pink flying suit (not my colour but I grew to like it and went to Heathrow to pick up a friend still dressed that way – I was very tight on time – and got the appropriate reaction!) and a not-wildly-comfortable harness, helmet and goggles. Then you join your flying partner (Si is from the military and has 1,500 flights logged and lots besides) and get into a plane with a very large hole rather than a door (as a friend on the ground commented rather anxiously). Inside you sit in jumping order (we were 4 of 4), on the lap of your flying partner (yes, there are lots of ribald jokes to break the tension) strapped tightly at shoulder and hip. When your turn comes you waddle over to the door where your partner sits on the edge and you hang out in fresh air, and find yourself launched into the air almost instantaneously, alongside the camera guy jumping with you (a digital SLR and a video camera attached to his helmet). There is a first millisecond of being horizontal to the ground looking directly downwards when you realise just how very, very, very high up 10,500ft really is (the only moment I felt any anxiety)! And that you are falling!!! You eventually reach about 120mph so keeping your mouth shut helps avoid looking as though you have eaten all the cakes. But you do have to remember to smile for the cameras! And then, very quickly it seems, there’s the jerk of the parachute releasing, a more upright position, and glorious quiet – this must be the closest one gets to being a bird flying. We zoom around (yes, I try steering), enjoy the view and the other flyers below, spot the crowd on the ground and chat as we fly. Then, all too soon, there is the instruction to raise your knees, then extend your legs (I can be very compliant when I need to be! ), and Si takes control of the safe landing. And it’s all over! I would have flown again immediately given the chance. I loved it! It was challenging, exhilarating, awe-inspiring, and an extraordinary experience. After such a challenge, the seven of us felt we had known one another for ever. There was a huge surge of emotion on our safe return with a sombre reflection of the challenging journey faced by those with breast cancer. And see selected photos on Picasa. My heartfelt thanks to you all for your wonderful support. There’ll be more shortly on my fundraising page at . And we’re looking for volunteers for Flight 003!